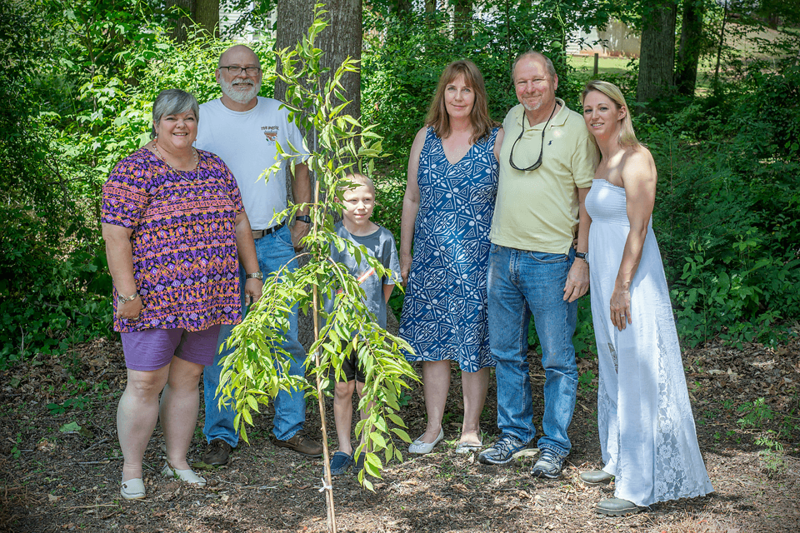 My experience with the Living Urn and Mike has been so positive and rewarding that we now have a tree planted with my husbands cremains on the golf course right outside our fence line on the 17th fairway. I can see the tree from every window at the back of the house. 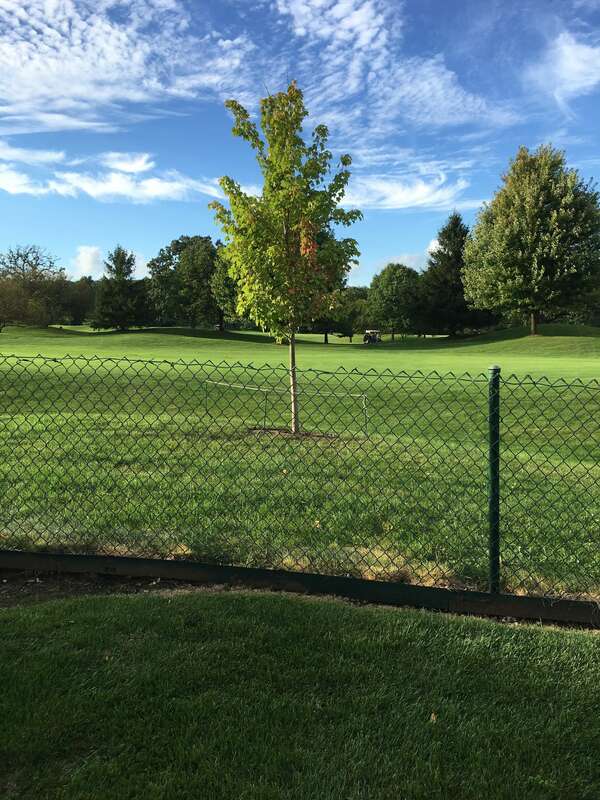 Because we were planting on a golf course, we needed to plant a sustainable tree, one that would stand up to the rigors of golfers, carts, and balls coming from various directions. My husband, George, was not an avid golfer but he was an avid gardener and spent many happy hours in our yard overlooking the 17th fairway. The golf course GM knew which house was ours because he recalled how well maintained our yard always was and how my husband was always out there puttering. The golf course could not have been more cooperative and supportive once I explained about The Living Urn and what I planned for my husband's cremains. On September 8, 2016, we planted an October Red Maple with George's cremains. The funeral director came to the house and prepared the urn which was not a difficult thing to do. The directions were very clear and the biodegradable urn was large enough to contain the cremains, the mixture, and the topsoil. I have attached pictures from the planting. The golf course invited us to participate in the planting so our children and I were able to actually place the urn with the tree root ball. It was a very moving experience and was attended by the immediate family, some close friends and a few neighbors. On September 18, 2016, we had a celebration of life at the golf club and shared the experience with the individuals who attended via a slide show presentation, still pictures, and comments explaining what The Living Urn is and the alternatives for cremains it offers. I can't tell you how comforting it is to look out each day and see the tree, knowing George is part of a new life. I will watch the tree as it grows straight, and tall, and strong, just like my husband, George! Thank you! 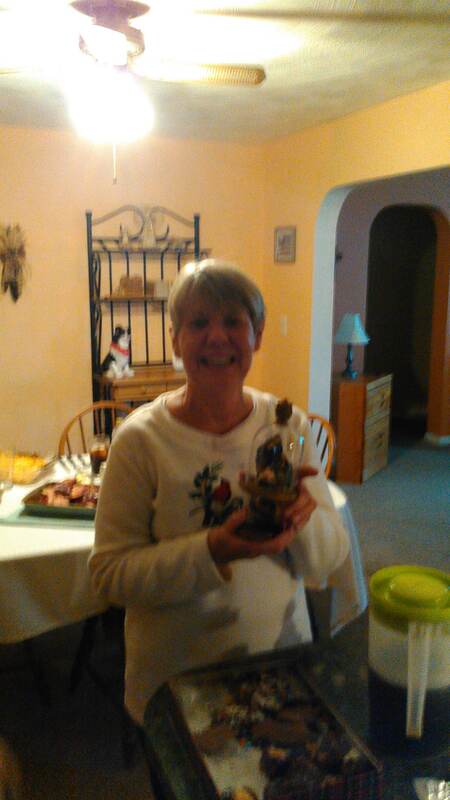 My sister Kathleen died in a car accident on May 6, 2016. Our family knew that cremation was the best option for our situation, but we really didn’t have any experience with cremation as most of our family members who had passed had opted for traditional burials. When the time came to choose an urn, my sister’s fiancé said that The Living Urn really spoke to him as being something that she would have wanted. She was a very giving person in life, and this would be a way for her to continue giving even after her death. We all agreed that we were open to this option, as long as we could find the right place to plant the tree. 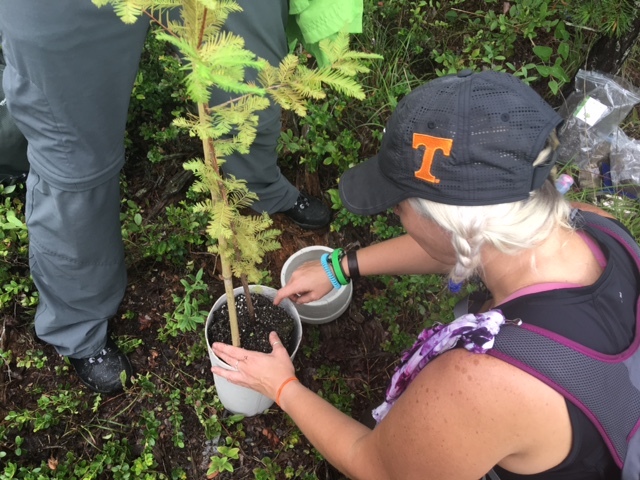 We wanted to make sure that the tree wasn’t planted on land that would be sold in the upcoming years, and it needed to be somewhere that would allow access to whoever wanted to visit. In the end, the right place ended up being on our church property (with their blessing, of course). Our congregation was blessed to have a couple acres of land, and it is the same church that baptized Kathleen in 1984 and where our family still attends. 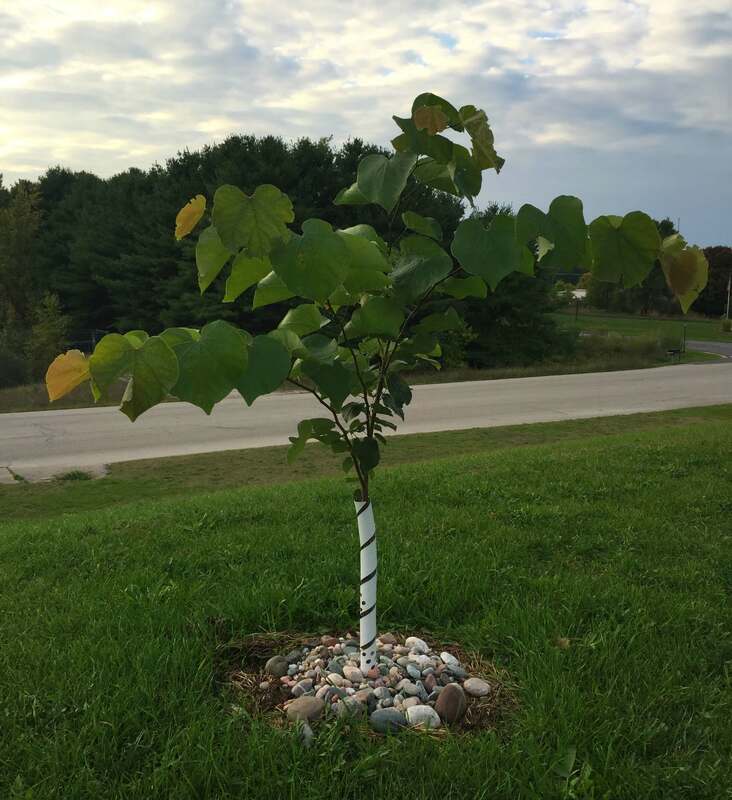 We wanted to choose a tree that had pink or purple blossoms (her favorite colors), and the wonderfully helpful staff at The Living Urn suggested the Redbud tree. The tree arrived at the funeral home with everything we needed to plant. We all gathered together on a June evening – our parents, Kathleen’s children and fiancé, along with other family members and friends. 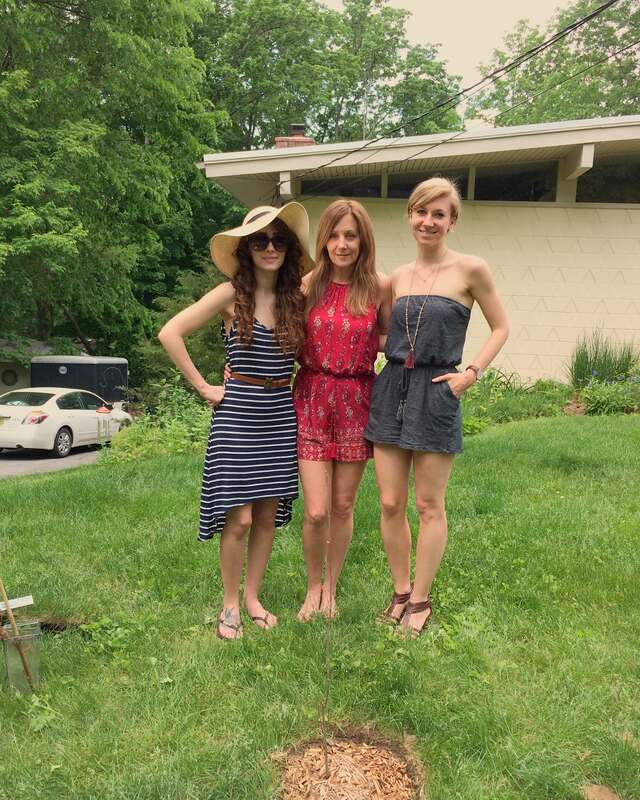 As much as we expected this to feel like a traditional burial, it was so different – it wasn’t that we were burying the person we loved, we were starting a new life with her remains, something that would grow and flourish. She would live on not only in our hearts but through this tree as well. I will not soon forget watching her 12-year-old daughter and 8-year-old son as they help to dig and fill in the hole for their mother’s resting place. We were still feeling sadness, sure, but there were no tears because it wasn’t the end – it was just the beginning. She rests on the crest of a hill just to the west of the sanctuary were we attended church. The tree overlooks the old church building where she was baptized. 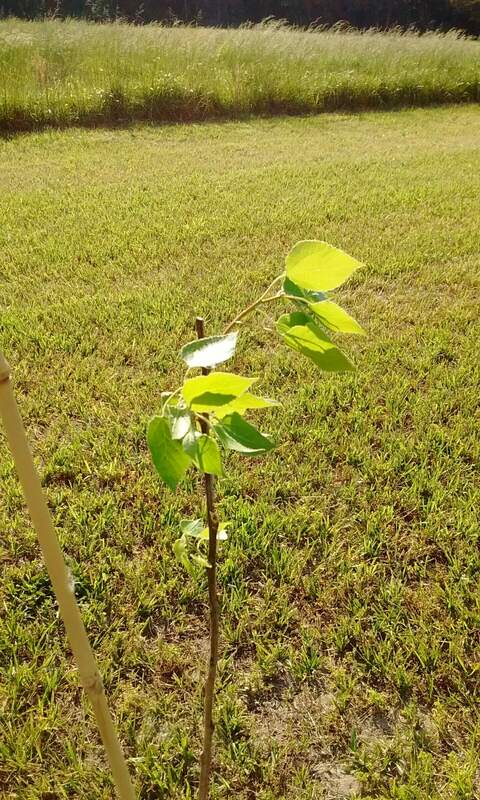 Within two weeks of planting, the tree had sprouted little heart-shaped leaves, which are now larger than my hand. The trunk of the tree was skinnier than a pencil when we planted, but is now at least an inch in diameter. The tree is thriving! We visit her every Sunday when we come and go from church. It’s a continual connection with Kathleen, and has really been a positive silver lining on the dark cloud of her death. The Living Urn was the perfect choice for us and we would definitely recommend it to others considering their aftercare options. The staff was so helpful and patient with my endless questions, and the bamboo urn holder was a beautiful addition to the funeral ceremony. On behalf of our family, thank you for offering this wonderful alternative to traditional burial, and thanks to your staff for their excellent and compassionate service. On April 21, 2017, I had to make the difficult decision to euthanize my beloved dog, Clarice. 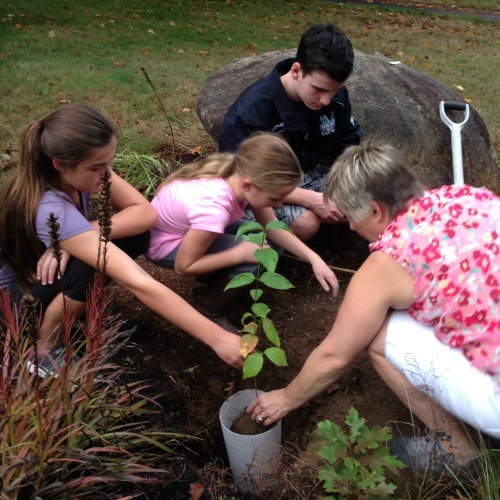 I felt the best way to honor her memory was to plant a tree using The Living Urn. I ordered The Living Urn and it arrived in a few days. 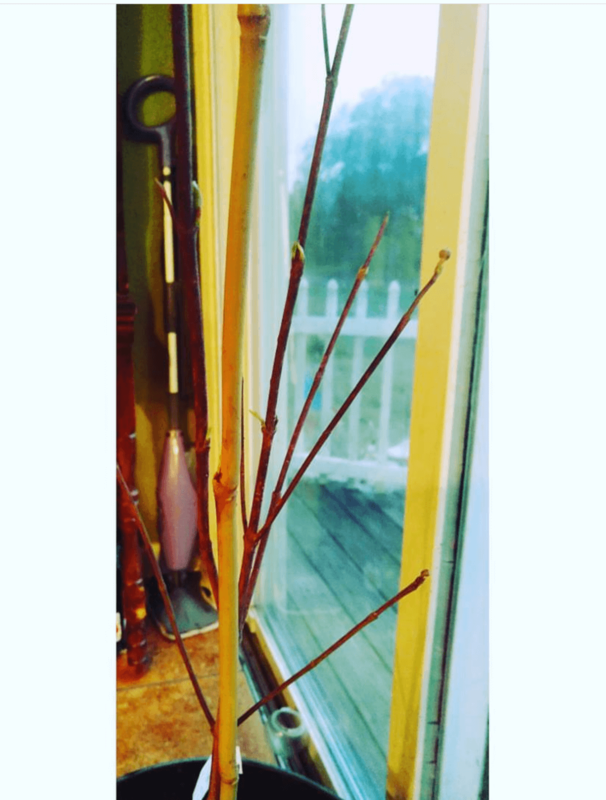 Clarice was a coonhound mix, so I decided to plant a Quaking Aspen tree that has white bark with golden leaves to match her coloring. 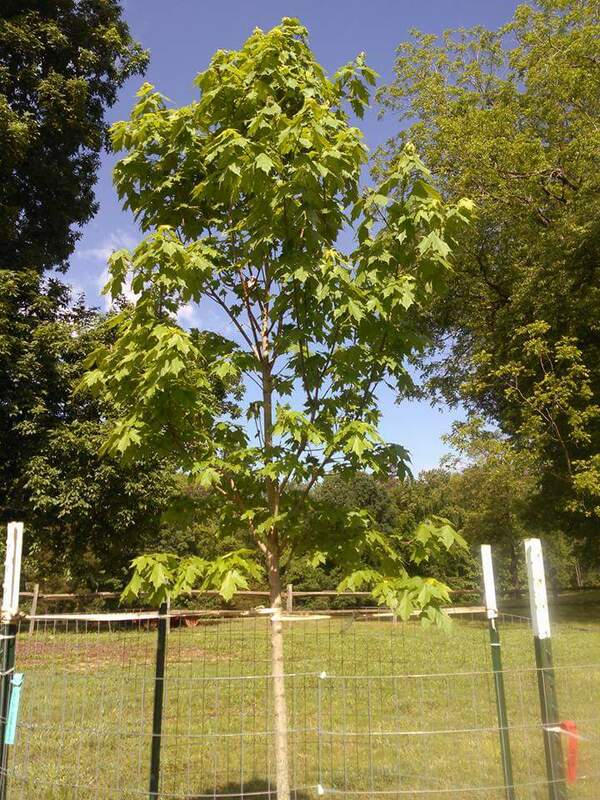 The Arbor Day Foundation shipped the tree at the perfect time for optimal planting several days later. I followed the The Living Urn's detailed and easy to follow directions for preparing and planting the biodegradable urn. On May 7, 2017, I planted the tree. It has only been a couple weeks and you can see from the pictures that the tree is thriving! I am so glad I decided to honor Clarice with The Living Urn. A while ago after I lost my step father, my mom started looking into after death options. She faced a burial with plaque and spent over 15 thousand dollars on my step father's funeral. She didn't want us kids to have to go through that. She researched the living urn and really fell in love with the whole idea. We joked around about it but, it really seemed like a neat idea. Well, she broke her hip about 4 months after that. An infection ended up taking her life. That's the hardest thing to have to deal with. After some grieving, I was determined to fulfill her last wishes. I purchased the pink dogwood (that's exactly what she wanted)!! The customer service was excellent. I must say they made it so easy.. And that's what people need when there world is turned upside down. I don't have a good picture of the tree at this moment because it's early spring and we still have 2 inches of snow on the ground. It has been 4 years since our daughter passed away. It has been a very long road, but once I saw the Pink dogwood on your website it just felt right. My husband an I searched for quite some time. It just never felt right as a mother in my heart. Being able to plant my daughter has given me what I have been longing for. I can finally watch her grow. I only got 2 weeks with her. Given the circumstances one can understand the need to see my child grow. Her tree has just started sprouting leaves an it brought tears of pure joy to my eyes. Thank you for giving me what I have wanted so badly. Words can never express the gift you have given.